According to Nielsen’s latest Trust In Advertising report. The good news for advertisers is that consumers around the globe are more trusting now than they were several years ago. In fact, the study reveals that trust in online advertising is increasing, as is trust in ads on TV, radio and movie screens. 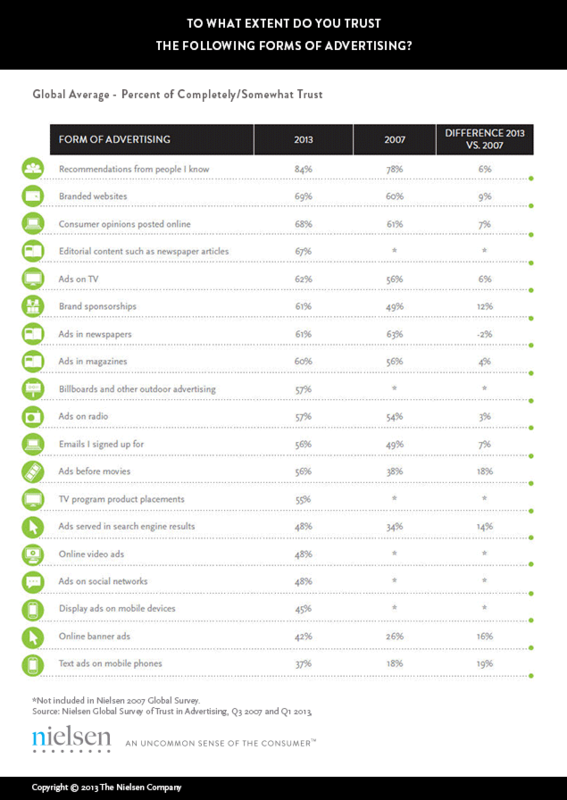 Word-of-mouth recommendations from friends and family, often referred to as earned advertising, are still the most influential, but trust in advertising on branded websites increased 9 percentage points to 69 percent in 2013 as the second most trusted format. I think this survey underscores the importance of having a website and the impact it can have on your prospects.